The first move I’d like to make is to fire my entire staff and replace them with candidates of my choosing. However, with our entire season budget standing at around €70,000, I can’t afford to terminate many contracts. 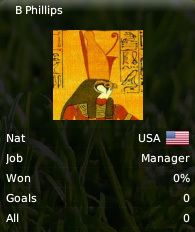 Which means I’m going to have to spend at least a couple of seasons tolerating the help of men like my assistant manager, Walter Colombo, whom I have already grown to loathe. Fantastic. How do you get to be an assistant manager at a top club like Pro Vercelli when your man management skills, your determination, and your motivational abilities are so inadequate that they register at the lowest possible point on the numeric scale? When it comes to judging player ability, the difference between Walter Colombo and a six-month-old baby is that Walter is under contract through 2013. Fine, I guess he can get my coffee. It’s no better anywhere else around the offices, of course. I haven’t taken a hard look at the squad yet, but my first impression is that they’re really young—more than half our players are teenagers. My second is that we’re never going to live up to expectations (the media have Pro Vercelli picked to win promotion from the Lega Pro Seconda Divisione Girone A, which for sanity’s sake I will henceforth call Serie C2/A) if we don’t do something about our goalkeeper problem. Our current pair look like they’ve just escaped from a glue factory, and one of my first objectives as manager will be to send them back. Well, first things first. I have to see what I can do about our scouting system, devise a set of tactics, and cut whatever dead weight I can to help free some room in our wage budget. (We’re currently only €175 in the clear, and our average weekly salary is €180.) Oh, and I’m giving my inaugural press conference at our stadium—the Silvio Piola, named for our legendary striker from the 1930s who became the highest goalscorer in Serie A history—in just a few hours. There’s a lot to think about. I’m using a large database, with Italy as the only playable country (I don’t intend to leave) and all leagues selected. Serie C2, where we’re currently residing, is the lowest available in the game. Our starting budgets: €73.78k for transfers, €10.66k for wages. I’ve had worse. I haven’t seen the bookmakers’ odds yet, but according to the media, our main rivals for promotion will be Carpenedolo and Rodengo Saiano. If I have one rule in life, it’s that I refuse to lose to a club with a panda on its crest. I’ll try to post frequent updates during my flurried early days with the club, so check back soon for history in the making. haha I wish you well. I have taken Cisco Roma to C2 glory and am now competing for the playoffs in C1, not to mentioning winning the Serie C cup last season, so I await with interest your updates. Fwiw my assistant is little better than yours. I give him the boring jobs to do, I think he gets a lot of paperwork. And here you’ve been telling everyone you are underwater with “work”. Tsk, Tsk. Brian, you might want to re-think your avatar. 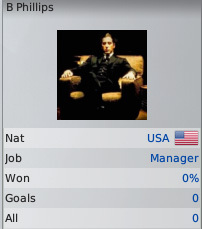 Having an American in charge of the Bianche Casacche is already going to be hard for the locals to accept. Having it be an American of Sicilian heritage may well be a bridge too far. Is it a panda or is it an Elvis wig with the top half of a baby chimpanzee’s skull perched atop it? Kudos for going with fictional players – I’ve never had the nerve, myself. Forza! Ursus, you make an excellent point. I need something that will imply a certain ruthless indifference to their feelings, but without thereby suggesting that their entire way of life is under threat. What I need is a symbol that tells them that I don’t care about them personally, but that if they submit to my vision for the team, I will carry them to where they want to go. After giving it some thought, I have decided that the most reasonable way for me to project my identity is by appearing as Horus, the Egyptian god of the sky. Fredo, you’re right, it looks like the head of someone who died in an Elvis costume in 1976. Brian — this club wants an Angry American. Run with it. The algorithms will respond to your sense of homegrown exceptionalism. I myself have made it a lil hobby or tradition if you will. Every year i take Pro Vercelli and take them thru the Series. My best game was with CM3(2001 version) I played 10 Seasons until 2011 and won the Italian Title in 2011. Also including 5 UEFA Cup throfies, 4 Italian Cups and 1 Serie C Cup, my coaches included Rivaldo, Seedorf, Col, my main scout was Hagi. With FM09 im currently on the 3rd Season and fighting in Serie B to hopefully achive a mid-table position. All the latest Football Manager 2014 news.